I wrote this post in January 2017, when I decided to cut this out of my original post of A Hard Look At Crossrail 2. Now nearly two years later, I have decided to update the post after the new platforms have reopened at Waterloo station. These suburban termini and their routes into Waterloo station are proposed to be connected to Crossrail 2. The times are for a typical one-way journey from Waterloo, which usually has a frequency of two trains per hour (tph). I suspect that the timings are designed, so that they can be achieved by a 75 mph Class 455 train. Waterloo station is getting a massive upgrade in August 2017, which I describe in detail in What Is Happening At Waterloo In August?. That upgrade has now partially opened and should be complete in May 2019. After the upgrade, Waterloo station will handle the suburban services better than it does today. There will be extra platforms, with the reopening of the five platforms 20 to 24 in Waterloo International. These platforms should be able to handle another twenty tph. There will be longer platforms, which will all be able to take ten-car trains. There will be an improved track layout, both in Waterloo and on the approach. There will be related improvements to improve access to the Underground and the Waterloo and City Line at Waterloo station. All this should mean Waterloo station, will be capable of handling a substantial increase in trains and passengers, with an improvement in efficiency and comfort. As I said in Rail Engineer On New Platforms At London Waterloo, the number of passengers handled in a year will increase by twenty-five percent. Each branch has its own problems, but the following would help in various places. Some level crossings on the branches can probably be removed.. Improved access to onward services like buses, cycling and walking at some stations. Some trackwork to allow Crossrail 2’s proposed frequency of 4 tph. These improvements will generally be needed, whether the services terminate in Waterloo or are a part of Crossrail 2. Currently, suburban services out of Waterloo are run by a large mixed fleet of generally excellent trains. 127 Class 450 trains – 100 mph – Entered service in 2003. 137 Class 455 trains – 75 mph – Entered service in 1982. 30 Class 458 trains – 100 mph – Entered service in 2000. 30 Class 707 trains – 100 mph – Entering service in 2017. This gives 264 four-car trains and 60 five-car trains with a total of 1137 carriages. South Western Railway will are purchasing 30 five-car and sixty ten-car new Aventras with a total of 750 carriages. The Class 707 trains and the Aventras could offer serious performance improvements, as they are probably designed to be able to have a short as possible time, for a stop at a station. In an ideal world, all trains running these branches would be identical and all platforms would be designed to fit them perfectly, just as many Overground platforms, fit the Class 378 trains. Crossrail 2 would do this, with possibly the same Class 345 trains, that have been developed for Crossrail. But why shouldn’t the routes be worked by a homogeneous fleet, serving platforms and stations designed for the trains? I believe that Crossrail 2 could make no extra difference to the passenger going between these branches and Central London, except for the route from Wimbledon, which will be in tunnel. But the new Aventra trains will have three very big effects. They will be walk-through ten-car trains. They will have much better capacity for bags, cases and all the other paraphernalia passengers bring. But most importantly, if they live up to the claims of train manufacturers, the high performance, well-designed trains with a consistent train-platform interface will save as much as three minutes a station. Trains will stop from line speed faster. Trains will accelerate back to line speed faster. Bigger lobbies, will enable passengers to load and unload faster. Wheelchair passengers and buggy pushers would roll across on the flat. Regenerative braking and light weight will save the train operating company in electricity and train access costs. Until we get actual figures, even one minute a stop, would reduce times on the branches as follows. Figures in brackets are for two minutes a station. Note that the first three services are now under half-an-hour, without making any allowance that the timings will be for a 100 mph train with better performance, than the 75 mph Class 455 trains. Is Four Trains Per Hour Possible? If the round trip from Waterloo can be done in an hour, that means that just two ten-car trains can provide a 2 tph service, as opposed to the four trains now needed. I suspect that South Western Railway will be experimenting to see if they can get a Shepperton round trip in under the hour. It may seem difficult, but there are certain factors in their favour. The Shepperton Branch Line is self-contained after it leaves the Kingston Loop Line. It is double-track, so there is no passing loop problems. There are no level crossings. The stations on the branch are fairly evenly-spaced at just over a mile apart. If a total out-and-back time from Waterloo could be under an hour for each branch, this would mean that a 4 tph service on a branch, would need just four trains. So for each branch to have 4 tph would need just 16 ten-car trains, with similar performance and characteristics to Class 707 trains or the Aventras. Currently, to provide a 2 tph service, needs sixteen trains, because it takes over an hour to do a complete round trip. Would it be possible for trains to shuttle up and down these branches? Look at the example of the East London Line, where four tph shuttle between dedicated platforms at Highbury and Islington and Dalston Junction stations in the North of London to various destinations in the South. In Increased Frequencies On The East London Line, I reported on Transport for London’s plans to up the frequency on this line to 20 tph. So could we be seeing something similar at Waterloo, where trains to Chessington South, Epsom, Hampton Court and Shepperton stations, each have their own dedicated platforms? The four platforms could even be adjacent, so if you want Wimbledon or a station common to more than one branch, displays would lead you to the first train. Put simply to provide 4 tph for all branches would need 16 modern ten-car trains and four dedicated platforms at Waterloo. How efficient is that for passengers and train operating companies? Wikipedia says this about Crossrail 2 services to these suburban branches, after surfacing from the tunnel South of Wimbledon station. I think that Wimbledon will have to handle perhaps another 8 tph from other places on the fast lines. But they do that now! South Western Railway have not disclosed their hand yet, but I suspect that they are doing the maths. I think that it will be possible for a 4 tph Crossrail 2 service and all the other slow services between Wimbledon and Waterloo to use a single pair of tracks carrying 20 tph. Surely, if 20 tph can be handled on the East London Line with ten year old signalling technology and Class 378 trains, then this frequency can be handled with modern signalling and new Aventras. It should be noted that Crossrail and Thameslink can both handle 24 tph under Automatic Train Operation (ATO) in a tunnel, so surely the slow lines can handle 20 tph on the surface under ATO or just using plain good driving. There could even be capacity for some extra services. Wimbledon station would only need two platforms for these services, but I do feel that work would need to be done to accommodate the passengers. But the station would probably not need the massive modifications until it was decided to build the Crossrail 2 tunnel. If all these trains can be accommodated on just two tracks between Waterloo and Wimbledon, then these services could call at two dedicated platforms at Clapham Junction station. Staff and passengers would see a succession of identical trains stopping every three minutes. Passengers would have a maximum wait for fifteen minutes for a direct train, to their specific destination. All trains to stations on the branches would use the same platform, making it easy for passengers. As on the East London Line, trains for any station on the branches would be to a clock-face pattern. The two platforms could be opposite faces of an island platform, with a waiting room, cafe and toilets in the middle. If it can be done at Clapham Junction station, why not have a dedicated pair of platforms at Vauxhall station, giving access to the Victoria Line? I use the link at Vauxhall, between the Victoria Line and Waterloo suburban services occasionally and every time I do, it seems to have been improved. 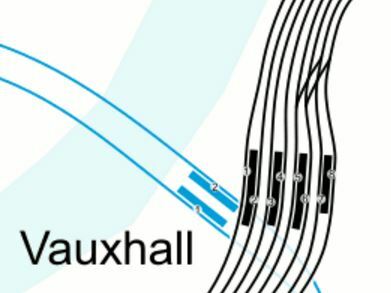 This map from carto.metro.free.fr shows the lines at Vauxhall station. I think it is true to say, that if the Victoria Line had been built in the last decade or so, the Victoria Line station could have been placed underneath the main line station. But even so, I suspect Network Rail and Transport for London have ideas to improve the interchange. My calculations show that modern 100 mph trains, like the Aventras that South Western Railway have ordered could provide 4 tph on the Crossrail 2 routes with just sixteen ten-car trains. All the calculations I’ve done show that replacing trains with faster modern ones, increases the frequency and results in more efficient use of trains. South Western Railway have bought sixty of these trains. So they must have some impressive plans! Crossrail 2’s proposals for the suburban branch lines from Waterloo to the four destinations of Chessington South, Epsom, Hampton Court and Shepperton stations, can be fulfilled using the following. More platform capacity in Waterloo. Modern high-performance 100 mph trains like Class 707 trains or Aventras. Some improvements to track and signals between Waterloo and Wimbledon stations. Wimbledon station would only need minor modifications. A measure of ATO between Waterloo and Wimbledon stations. What effect will this have on the design of Crossrail 2? Should The Drain Get The First New Tubes For London? Introducing new trains onto a rail route can be a difficult process, where all sorts of problems occur. Currently, London Overground are introducing Class 710 trains on the Gospel Oak to Barking Line. As the trains are about eighteen months late, I think that there must have been problems. I’ve never tested a train, but the modern train must require lots of systems to be tested and Aventras and other recent trains could best be described as computers-on-wheels. So I must admit, I was a bit surprised, when I heard that first route to receive the new Class 710 trains was the Gospel Oak to Barking Line. The line had only been recently electrified. Both diesel and electric freight trains use the route. Eight trains are needed to run a complete service. As this will be the first time the trains are used, there would appear to be a lot of things that could go wrong. The simplest route, where the new Class 710 trains are to be used is the Romford-Upminster Line. It is 5.4 km long. It has a 30 mph speed limit. There is only three stations, each of which are a single platform. The journey takes nine minutes. The service operates every thirty minutes. There is only one signal. Only one train is needed for the service. It must be one of the simplest electrified railways in the world. My instincts would have been to put a single train on this line and constantly shuttle it backwards and forwards. This was exactly how Bombardier tested the Class 379 BEMU train on the Mayflower Line. Only the train is being tested. Passenger systems can be tested. Passengers can be asked their opinions. If the train fails, there is a regular bus service between the two stations and service engineers are not far away at Ilford Depot. There must be good reasons, why this approach hasn’t been used. Perhaps, it’s just that London Overground are not going to use a Class 710 train on this route. There have been rumours of this, that I talked about in A Heritage Class 315 Train For The Romford-Upminster Line. London Underground are buying New Tubes For London from Siemens for four lines. First trains are to run on the Piccadilly Line in 2023. I think that it will not be a simple case of replacing one fleet of old trains, with another fleet of new trains, as has been done in the past. It was managed successfully in recent times on the Victoria Line, when 2009 Stock trains replaced 1967 Stock trains. But Siemens design is more radical and may need track and platform work to be performed before the trains can be run. My research in The Train-Platform Interface In London, showed that the interface seemed fairly consistent on the Piccadilly Line, so it may be easy to design trains to run the line efficiently with step-free access between train and platform. But what about the section of the line, where the trains share track with the S8 Stock trains of the Metropolitan Line. If the Piccadilly Line has to be closed to make it fit for the New Tubes for London, then it will be a major undertaking, even if it is done in sections. It would be a high-risk undertaking. I believe there would be advantages in creating a test line for the following purposes. Test the engineering for track and platforms. Test the train performance and reliability. One of the suburban sections could be used, but there could be problems. On the other hand the Waterloo & City Line could be an ideal test track. It has only two stations. It is only 2.4 km. long. It is integrated with a depot. The only problem is that trains have to be moved in and out by the use of a crane. Using the Waterloo & City Line as a test track does have other advantages. If the line had to be closed for any period of time for track or platform work, then in 2023, there will be some excellent alternative routes. Northern Line to Tottenham Court Road and then the Central Line to Bank. Northern Line to Tottenham Court Road and then Crossrail to Moorgate. Bakerloo Line to Embankment and then the Circle/District Lines to Monument. Jubilee Line to London Bridge and then the Northern Line to Bank. Southeastern From Waterloo East to London Bridge and then bus or walk. There is also the direct 76 bus and possibly others. It should be noted that from late 2021, the Northern Line platforms at Bank station will be much improved. So, if the Waterloo & City Line was used to test the trains, this in itself would not present any problems during closure or unreliable service. According to an article in the November 2017 Edition of Modern Railways, which is entitled Deep Tube Upgrade, new trains for the Waterloo & City Line will give a capacity increase of twenty-five percent. Testing of any automatic control system must be very rigorous and the short double-track route of the Waterloo & City Line would be ideal for testing automatic control of the new trains. Trains could test twenty-four hours per day and every day of the year and not annoy anybody. It could a valuable resource in training new drivers and converting others to the new trains. It is London Underground’s and Seimen’s objective to have the same trains on as many lines of the London Underground as possible. Siemens might get it right first time, but each line has its own quirks and design features and having a short line in London, where the next version of the trains could be tested by the public could be an advantage. I believe that introducing the New Tubes for London on the Waterloo & City Line before the other lines could give advantages in the testing and designing of the trains and for the passengers of this short route. 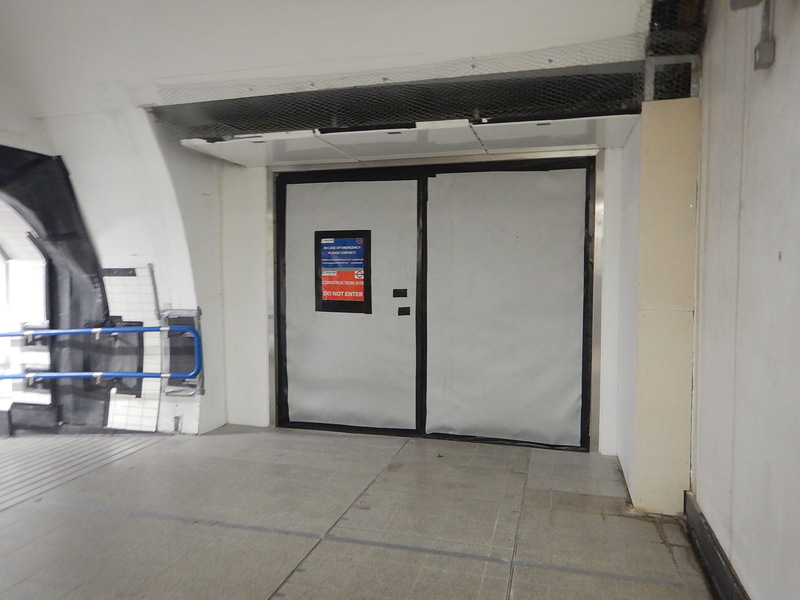 Ian suggests that the new entrance under the Bloomberg Building, which will give better access to the Waterloo and City Line, will open in August 2018. This picture shows the covered Underground roundel on the side of the Bloomberg Building. Note the workers putting scaffolding on the truck behind. 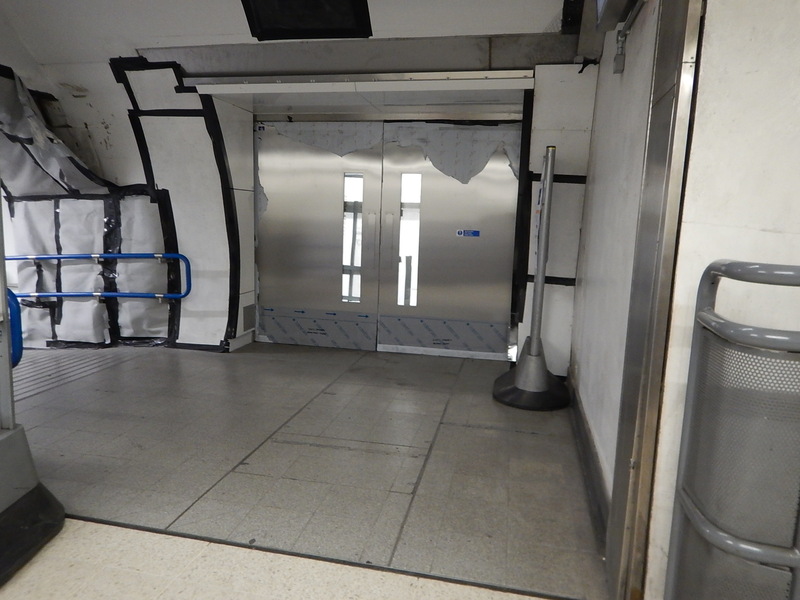 Underground, these fire doors, which lead to the new escalators and lifts, look ready to be opened for passengers in the area between the travelator, the connecting tunnel and the Waterloo and City Line platforms. IWill the area be tiled or just painted? described the tunnel to the left with the blue entrance rail in The New Tunnel Under Bank Station. This picture was taken from the tunnel on the left, looking at this area. The tunnel takes passengers right into the heart of the station. The new entrance at Bank station is the first of several major transport developments, that will happen in the next few years. The Northern City Line is London’s forgotten train line, with a history coloured by the tragic accident at Moorgate in 1975. The first development, a year or so ago, saw the Northern City Line introduce seven days a week working. Now, the Class 313 trains, which are some of the oldest in the UK, are being replaced with new Class 717 trains, that will offer increased capacity, frequency and passenger comfort. The Northern City Line terminus at Moorgate station will also be linked directly to Crossrail, when that line opens. For many travellers in the Northern part of London and Hertfordshire, their route to the City will be much improved. The final frequency has not been published, but it looks like there will be at least twelve tph on the Northern City Line to and from Moorgate station. With a step-free cross-platform interchange at Highbury & Islington station, effectively Moorgate station will become a second Southern terminus of the Victoria Line. This will be the first phase to be delivered and Crossrail will initially provide a twelve trains per hour (tph) service between Paddington and Abbey Wood stations from December 2018. This will mean that the double-ended Jumbo Crossrail station, which will serve Moorgate station at its Western end and Liverpool Street station at its Eastern end, will open a short walking distance to the North of Bank station. For those not wanting to walk, the link will also be one stop on the Central or Northern Lines. This will be the second phase to be delivered and Crossrail will initially be provided a twelve tph service between Paddington and Shenfield stations from May 2019. The full Crossrail service will open in December 2019 and will provide the following services from Moorgate-Liverpool Street. In the Central section, there will be twenty-four tph between Padsdington and Whitechapel stations. Bank station is being upgraded and this is said in Wikipedia. TfL is also retunnelling and widening the Northern line platforms, and adding lifts and new entrances on King William Street and Cannon Street. 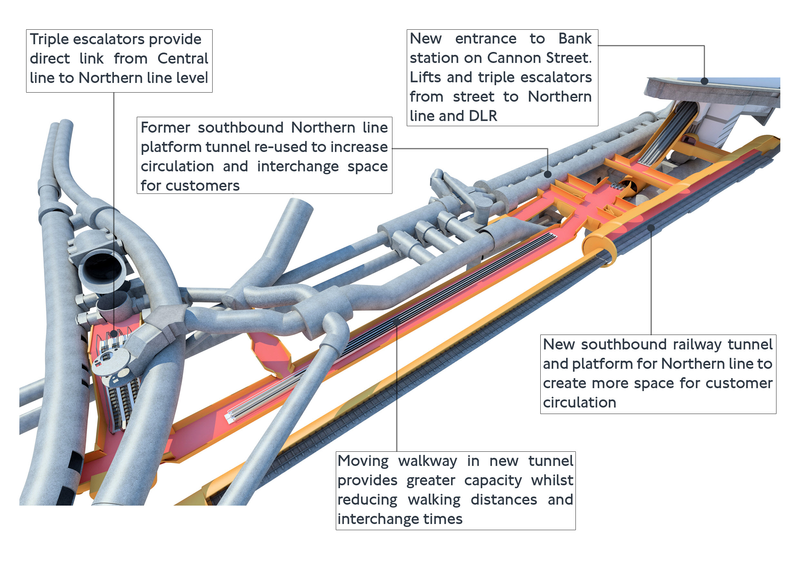 The work, agreed in 2015, will be carried out from 2016 to 2022 and will boost capacity by 40%, with 12 new escalators, 3 new lifts and a new travelator (or moving walkway) to connect the Northern Line and DLR to the Central Line. It is a massive upgrade, as this visualisation shows. Note that the two larger diameter tunnels at the left of this visualisation are the tunnels and platforms for the Central Line. 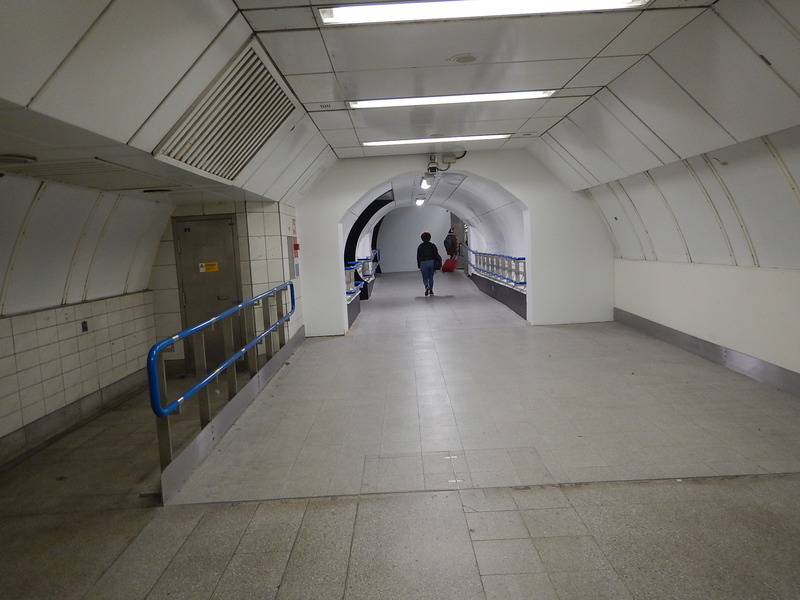 The third tunnel is the pedestrian tunnel that links the Waterloo and City Line to the main station. The capacity upgrade at Bank station, will surely mean more people will be drawn to the area. 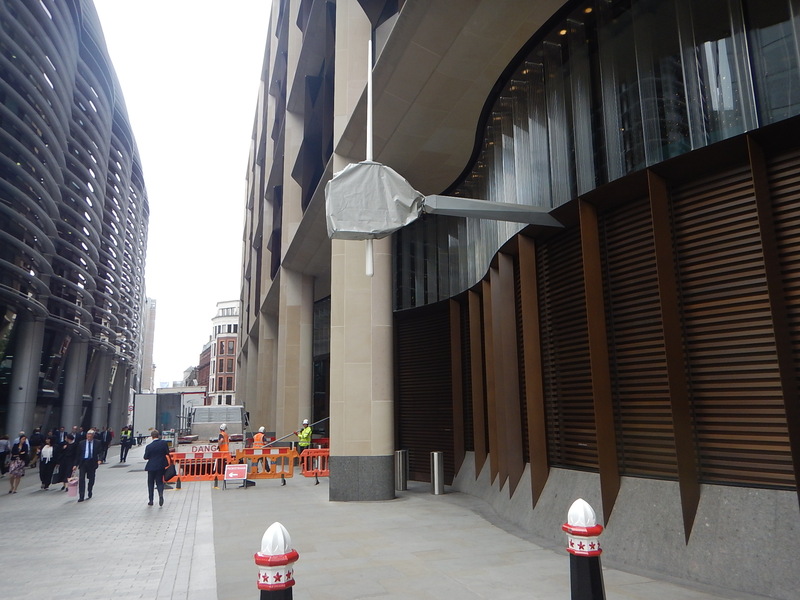 The City of London has a project called All Change At Bank, which aims to improve the roads and pedestrian routes at Bank Junction. Their web site gives these objectives. Improve the perception of place, as a place to spend time in rather than pass through. At present Bank Junction is restricted to buses and cyclists on Monday to Friday, between 0700 and 1900. I wouldn’t be surprised to see this restriction increased, especially as more pedestrians are drawn to the City at weekends and in the evening. When I lived in the City in the early seventies, nothing happened in the City in the evenings or at the weekends. Over the years, the City has started to use these freer times for other activities. The Barbican Arts Centre and Tate Modern have opened. Quality shopping has greatly increased and improved. Pubs, bars and restaurants have often increased their hours. Better walking routs along and over the Thames have opened. With its superb transport links, I can see the City of London becomes a much more important leisure and tourist destination. The City of London is becoming a 24/7 area of London and the Waterloo and City Line must go with the flow. It should run seven days a week, as do all other Underground lines. Eventually, there will be a need for a Night Drain! Could The Waterloo And City Line Have An Intermediate Station At Blackfriars? The Waterloo and City Line between Bank and Waterloo stations, is London’s shortest Underground Line. In the Wikipedia entry for the line, there is a section entitled A Blackfriars Station Proposed. This is said. In 1934 the LPTB, which now operated most of the London Underground system, proposed that the Waterloo & City should have a new intermediate station at Blackfriars, connecting with the District line station there. They further proposed that the Waterloo & City line should be extended to Liverpool Street station and Shoreditch, the trains there continuing over the East London Railway to New Cross and New Cross Gate. It is not clear whether the scheme had been costed, but nothing came of it. So have things changed since 1934? The line is only a mile and a half long and trains take about three minutes to go from end-to-end. Even allowing for the turn-round time at each end of the route, it must be very difficult with the current rolling stock to accommodate the time needed for an intermediate station. Thameslink didn’t exist in the 1930s and when it is completed, there will be 24 trains per hour (tph) passing through Blackfriars station. The Thameslink frequency could increase to 30 tph. How many Thameslink passengers want to go to Bank and Waterloo stations? Blackfriars station is fully step-free. I certainly think, that a Blackfriars station on Thameslink would be used by passengers. As a Control Engineer, I believe that with the right automation, that capacity on the line can be increased. I know the Unions attitude to driverless trains, but if ever there was a line, that would benefit, it is the Waterloo and City Line. Perhaps, the driving position should be in the middle of the train, so the driver wouldn’t have to change ends and drove the train using CCTV. London Underground has a plan to renew a lot of the trains, starting with the Piccadilly Line. These trains will have the following characteristics. Shorter stopping times at station. Air-conditioning and other improved passenger features. Would these trains and improved signalling enable an intermediate stop at Blackfriars to be added to be added to the line? I obviously haven’t seen Transport for London’s figures, but I’m sure, there will come a time, when an intermediate station at Blackfriars will be a project worth doing. It is a comprehensive report, but for me the highlight is this paragraph. Finally the Drain is being transformed into a SuperDrain.